Pin rails – The pin rails give Bodhran a salty appearance, but have also turned out to be incredibly handy. I originally built them to store the halyards while at the dock so that I wouldn’t have to bungee them away from the mast at night. 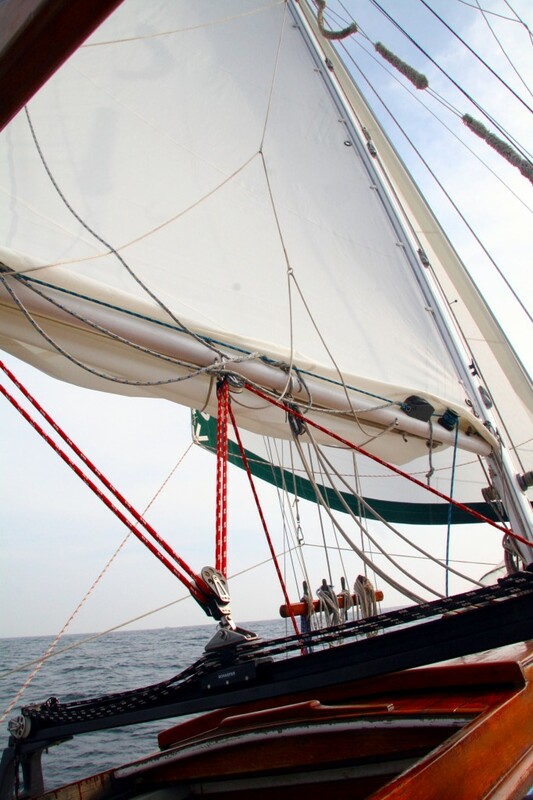 The pinrails perform this task admirably, but also keep the mast free of clutter while sailing as well. 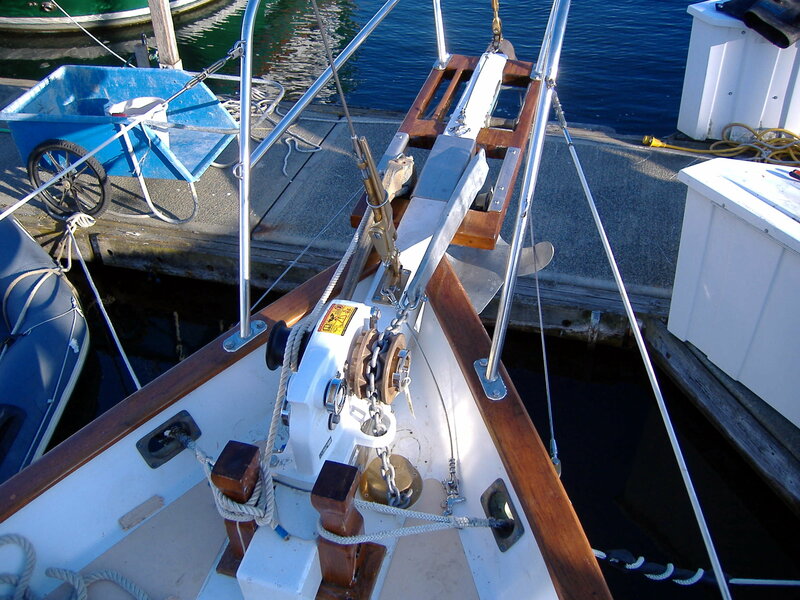 When I installed my removable lazy jacks, I didn’t install cleats on the mast, instead they just get the second forward on each side. My running backstays when not in use attach to the aftermost pin. My foreguy for whisker pole attaches to the foreward most pin both when in use and while stowed. You get the idea. The pinrails were fairly easy to build. First I got the bronze belaying pins from the Wooden Boat Foundation Chandlery. Then I took two mahogany 1x3s (teak would have been better) about 6 inches longer than the width of the lower shrouds where I wanted to attach them. I bolted them together and then drilled them out to accept the belaying pins. The I used a table saw to cut a 7/32” grove at an angle to match the shroud in one of the planks. Then just route the edges, slap some varnish on them and bolt them to the lower shrouds. The half without the groove compresses the wire into the grooved side to hold time in place. 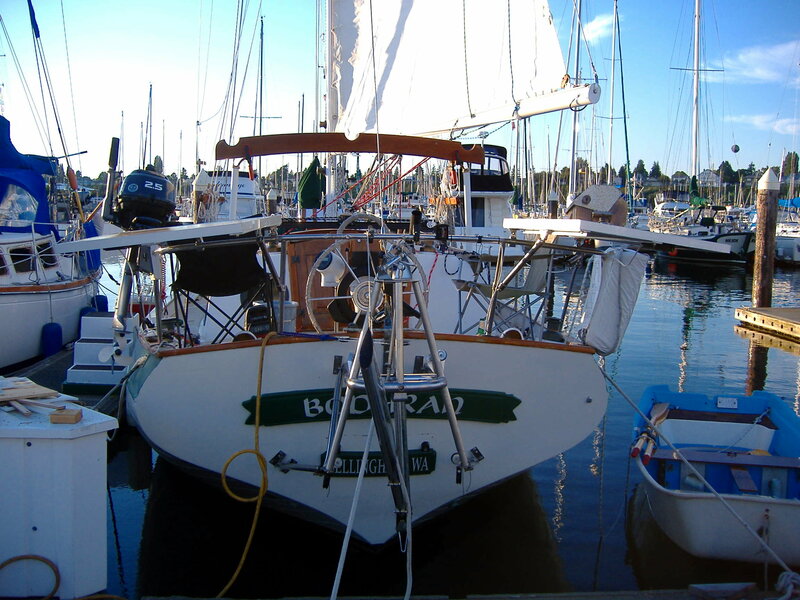 Chest high lifelines – Here’s an easy one I got from Brion Toss at a rigging workshop I took in Port Townsend. We all know that the knee high lifelines on a boat aren’t worth much unless you’re in really bad weather and are crawling forward, which I’ve certainly done my fair share of. Wouldn’t it be nice to have something there at a height that would actually stop you from falling overboard if you lost your balance instead of just tripping you further and sending you head over heels into the water? Well chest high lifelines are just the thing. Just last a d-ring to your cap shrouds at about shoulder height and then run a line from the bow pulpit, through the d ring and back to the pushpit, or even better the radar arch if you have one. They work even better on ketches, where you can attach a d-ring to the mizzen shrouds and keep the lifeline chest high for most of the boat. My lifelines cut in a bit right at the edge of the cabin top, but I never mind chafing against them at sea when I go forward, to the contrary it’s a nice feeling to be reminded that there’s something out there holding you in. Boom Gallows – Yeah, they’re pretty but they’re functional too. When I bought Bodhran the previous owner threw in a hunk of teak that he’d been meaning for years to turn into a gallows. Well it took me 4 years to get around to building one, but I’m sure glad I did. I picked up the bronze frames and bases from ABI and then used schedule 40 stainless for the uprights. My buddy Lou was kind enough to use his band saw to cut a nice curve into the wood and cut out the notches for the boom. Then I used PVC to mock the whole thing up and find the proper height so that boom would clear the gallows when raised. Then I clamped the rough cut teak in place and scribed the outline of the jaws, cut and fitted the wood, and slapped on some varnish. The Gallows is great while motoring in any kind of a seaway. It allows you to get the boom locked down solid and eliminates the creak as the boom sways back and forth. 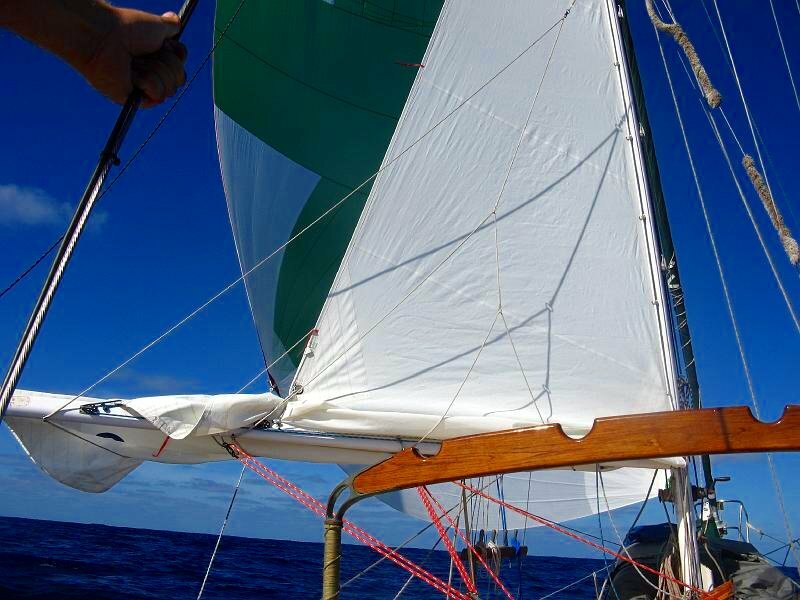 It does the same for those long downwind legs when you’ve just got the jib up or in those really hairy situations when you’ve got the main down and have the trysail up. With the boom sheeted tight against the gallows, the entire boom becomes a great handhold. The uprights also make great handhold when going forward from the cockpit. LED masthead light – Well this one is pretty easy. When I first took off in 2006 it was always really easy to find Bodhran in a crowded anchorage with her distinctive LED anchor light. Now it’s getting hard to find a boat that doesn’t have one. Those old incandescent lights draw almost as much current as my refrigeration and they aren’t as bright as the new LEDs. It amazes me that many people don’t use their nav lights while underway offshore because they draw too much current. I picked up my masthead light from SailorSolutions. They’re kinda pricey, but they only draw .2 amps and are very bright. I couldn’t be happier with this product. Monitor Install – Just like pretty much everyone else who owns a monitor, I’m in love with this thing. It steers a better course than I can in anything above 3 knots of apparent wind. Of course keeping the sails balanced has a lot to do with this, but I also believe that my install works particularly well as it eliminates a couple of extra blocks and keeps the friction in the system to a minimum. What I did was to install the monitor so that the base of the unit was even with the cockpit sole. I then glassed in two 1.5” PVC tubes between the transom and the cockpit. Instead of running the Monitor control lines through the frame of the windvane, I lashed to good roller bearing blocks to the frame. The control lines run from the steering oar, through my blocks, through the transom tubes and then through blocks on the cockpit sole directly below the wheel adapter. So each line only goes through 2 blocks and the control lines are out of the way and don’t pose a tripping hazard. I also got two more cockpit drains out of the measure. Surprisingly I haven’t ever noticed any water come in through these tubes even though I’ve done 1000s of miles downwind with sizable following seas. 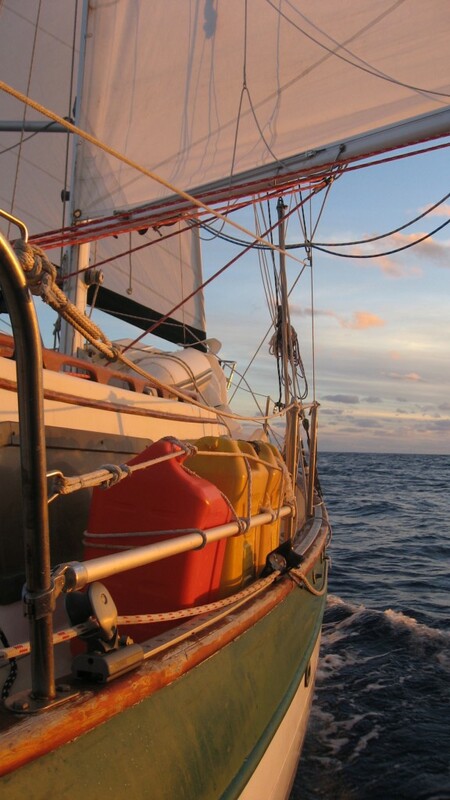 Mainsheet Traveler – When I bought Bodhran she had the end of boom “A frame” style mainsheet system with no traveler. The system worked. There was lots of mechanical advantage, I didn’t need a winch to sheet the main and having the sheet at the end of the boom is the best possible place for it to keep the boom from breaking if it ever dips in the water. On the other hand, I had miles of line for the main sheet and it would take the head off the helmsman whenever I gybed. It also prevented me from having a bimini over the cockpit, which really is essential in the tropics. So I decided on changing to a mid boom setup with a traveler. The Schaefer traveler with risers did a nice job of securing the traveler to the cabin top while clearing the companionway. Having the traveler forward means that you get much more control over the boom than you would if if you had a traveler at the end of the boom. As it turns out, whenever the seas are really running and I’m worried about the prevented boom hitting the water, I’ve got a double reef in and the boom is raised high enough that it hasn’t been an issue…..so far. Reefing Winch/Lazy Jacks – Being able to reef in a hurry is a the top of my priority list for offshore sailing. It’s right up there with self steering in order of importance. I’ve elected to keep my cockpit and decks as clean as possible and don’t run any of my lines aft. I use slab reefing with the aft lines for both the 1st and 2nd reef points run through individual turning blocks on the boom and lead forward to a double rope clutch and cheap nylon winch at the forward end of the boom. 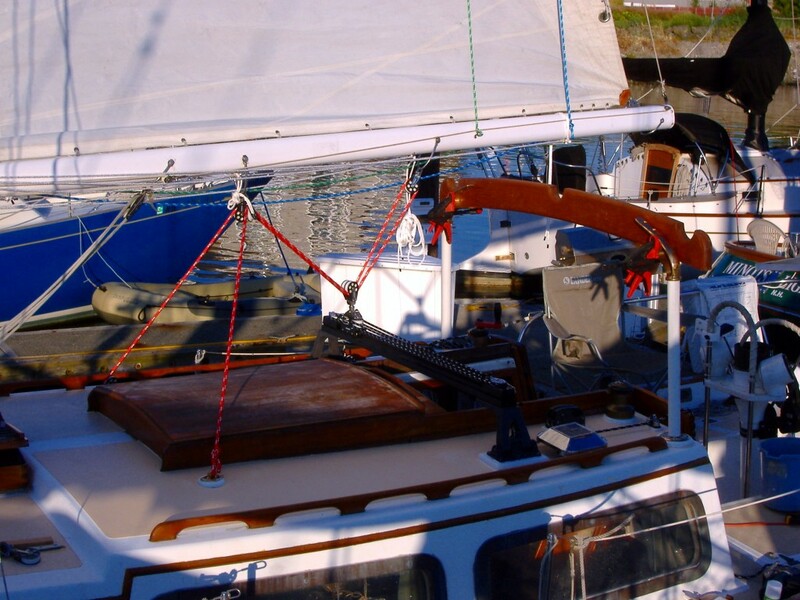 For the luff reef cringles, I use a 1/4” boom vang assembly attached to the base of the mast with a hook on the reefing hook on the end to place in the appropriate reef cringle. When it’s time to reef, everything is in one place. 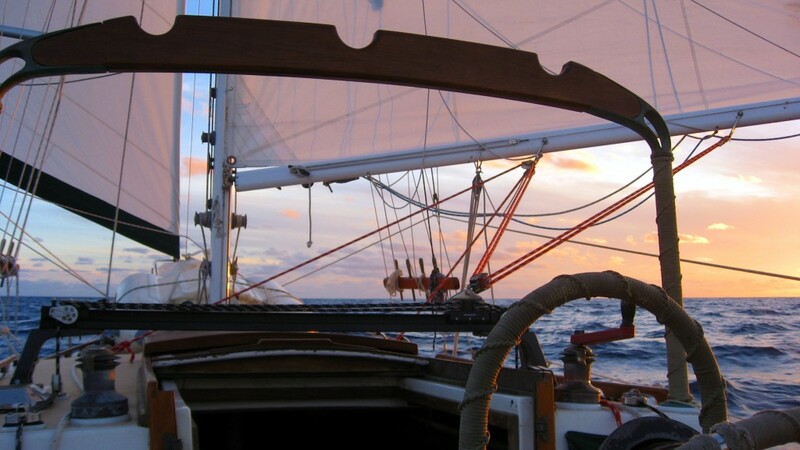 I ease the mainsheet, lower the mainhalyard to the appropriate point, winch in the after reefing line, put the hook in the luff reef point, pull tight on the 4-1 vang style setup, go aft and reset the mainsheet and I’m done. The whole thing normally takes less than a minute. 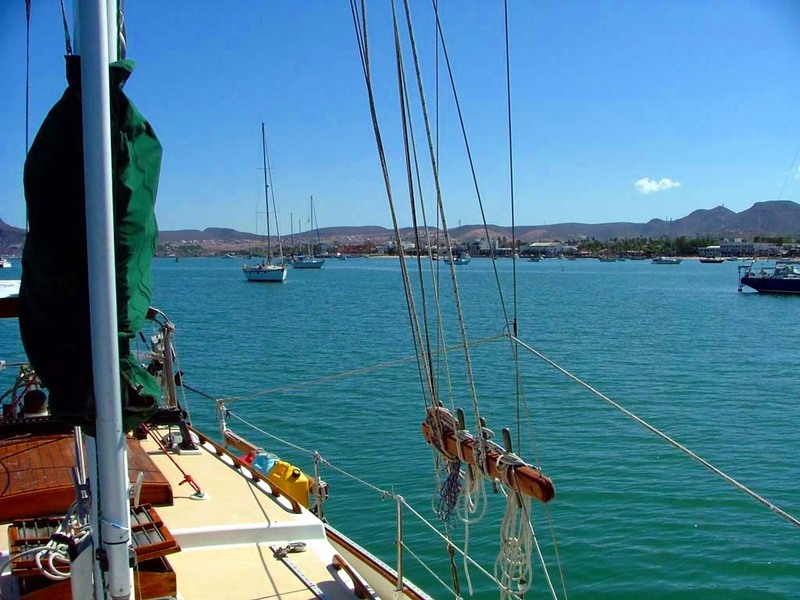 My ease of reefing is greatly enhanced by my battenless mainsail and my retractable lazy jacks that keep the furled sail neatly on the boom. The battenless main allows me to reef on any point of sail without having to round up into the wind. Bow Roller – The stock bow roller on the Down East 32 is woefully inadequate. It just won’t accept large enough tackle for the boat. I picked up a 20KG Bruce, which has been a great anchor for Bodhran and used it as the start point for a new roller system. I decided to leave the original roller in place and still use it very effectively for my snubber line. I decided to instead cutout the aft section of the bow pulpit and install a double roller in it’s place comprised of a u shaped stainless plate over the bowsprit and two l shaped plates on the pulpit on either side. A hole was drilled through all 3 with a 20-something inch long bolt stretching from one side of the pulpit to the other for the new rollers to mount on. 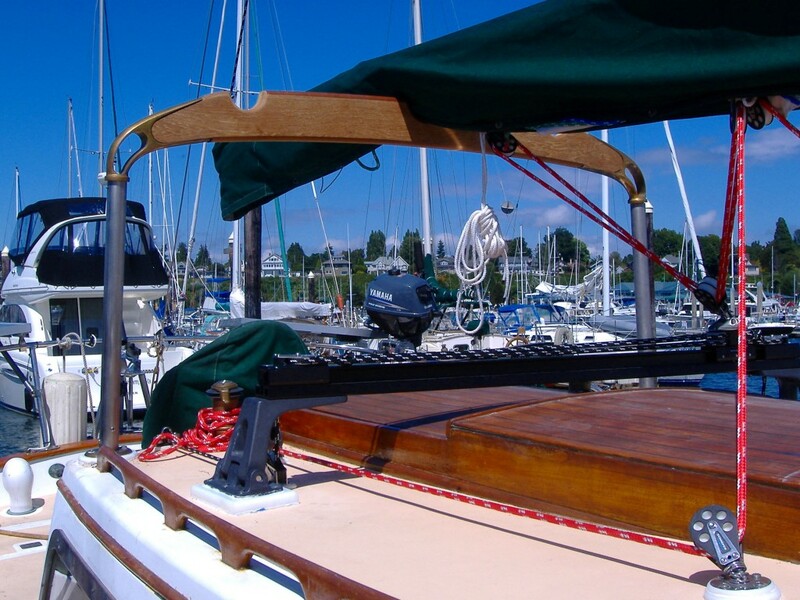 The system brings the weight of the anchor aft a bit, which I’m sure is good for the bowsprit, though the main pull is still on the snubber line and the original roller. It gets a little cramped getting my 35lb CQR secondary and my 44lb Bruce on there at the same time, but they do fit. The only real problem with this arrangement is that I periodically ding the gel-coat under the bowsprit when retrieving an anchor. A well placed metal plate on the bow would take care of this if I ever got around to it.